Chilika Lake with Olive Ridley Turtle Tours is one of the great ways to explore the beauty and bounty of Odisha on the whole. Every destination is screened during this tour to provide tourists with the best of everything, be it beaches, birds, wetlands, monuments, ancient caves, temples, handicrafts and artifacts. The delight of the journey is a visit to Chilika Lake where great numbers of birds flock during tourist season and welcome them with great delight. Same is the case with Rishukulya, where you get to see swarming population of Olive Ridley Turtle Tours. Such is the overwhelming experience of this great itinerary. On arrival at Bhubaneswar Airport, meet Incredible India Tour representative who will transfer you to your pre-booked hotel. 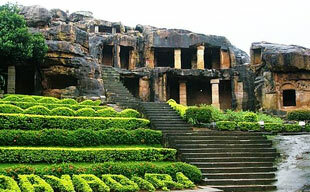 Check in & after wash n change; opt for a short sightseeing of Jain and Buddhist Caves at Udayagiri and Khandagiri. Overnight stay in hotel. Morning after breakfast, drive towards 25 km north of Bhubaneshwar for Nandankanan Zoo, famous for its White Tigers. Take a boat cruise to this majestic 400 hectare zoo and botanical reserve and explore the wildlife in the green and dense zoo. Afternoon, visit Pipli village famous for its arts and crafts. Grab your share of souvenirs from the village shops. Continue your journey towards Konark, for its famous heritage of Sun Temple. Carved in the shape of a majestic chariot, this monument is one of the reasons why a traveller visits Odisha. Drive towards Puri. Overnight at hotel. Morning after breakfast, pay a visit to the famous Jagannath Temple (Non Hindus are not allowed inside the complex). This heritage temple was built by King Chodangana Deva in 12th century A.D. to commemorate the shifting of his capital from South to Central Odisha. The Temple is dedicated to Lord Jagannath. Later visit Raghurajpur Artisans Village famous for its "Patachitra" Painting. Rest of the day is free for relaxing on pristine beach of Puri. Overnight stay Hotel. Post breakfast, leave for Rambha, one of the major town serving as entry point for the Lake Chilika. Rambha is a good base to discover Chilika Lake. From Rambha, board a boat to visit estuary ecosystem of Lake and watch aerial and aquatic birds. On arrival, check in at hotel. Later proceed to breakfast Island post 20 min boat cruise. Further the exploration to Lake Chilika via a visit to other islands like Beacon and Honeymoon. Also, don’t miss to visit Bird Island. Its beauty lies in its white granite rocks which are a result of bird droppings. If migratory birds are the reason of your visit to Chilika Lake, then miss visiting Nalabana Island which is a favourite hotspot for these foreign birds. Overnight at hotel. After breakfast, proceed to Rishukulya famous as the largest rookery of Olive Ridley Turtle Tours. Ridley Village. Often addressed as Olive Ridley Island, this beach is a great delight for those who want to see the nesting process of one of the only seven turtle species in the world. Board a boat and indulge for three hours in spotting hordes of Olive Turtles on the sea shore. Return to the main land & drive to Manglajodi village, famous as a bird dwelling wetland. On arrival, check into hut. Overnight at hotel. Post breakfast in the early morning, move towards this exotic wetland by boat where you get to see the number of birds and migratory birds. After this fulfilling sightseeing, tour back towards Bhubaneshwar. On arrival hotel check in. Overnight at hotel. After breakfast, take half day tour of Mukteshwar Temple & Raja Rani temple (Non Hindus are not allowed in the premises). Return to the hotel & you will be transferred to Airport/Railway Station for onward journey.